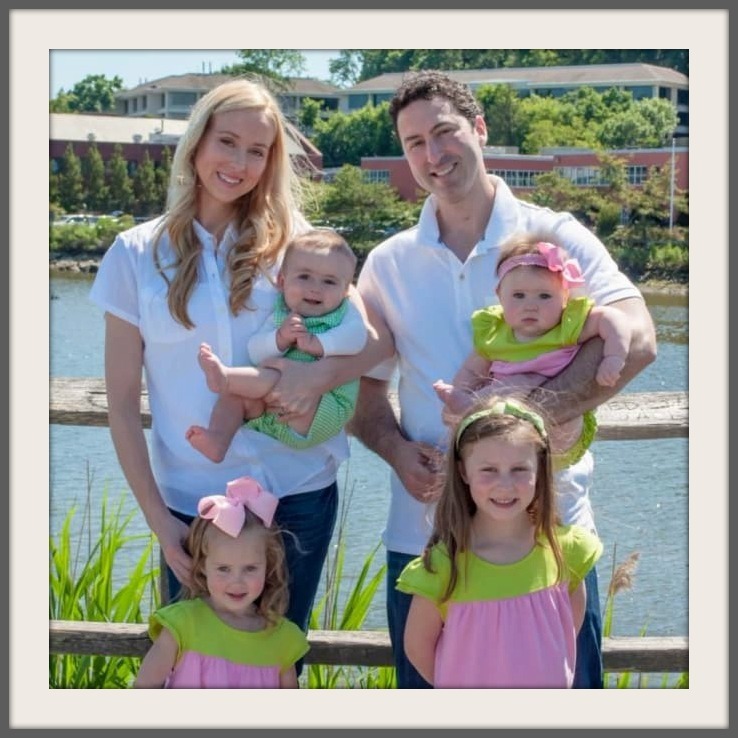 In 2011, financial arbitration lawyer Christine Meiers Schatz and her husband moved to Westport. They liked the town’s “open-minded, progressive” vibe. It seemed like a great place to raise their kids. As she became active in the school start-time issue — she’s founder and president of Sleep For Success Westport — Schatz learned a lot about local government. She saw few people in her demographic (women with young kids, like hers: 6, 4 and 2-year-old twins) on the RTM. Christine Meiers Schatz, with her family. But Schatz also believed it’s important for everyone in town to be represented. The RTM, after all, is the Representative Town Meeting. She ran for a seat in District 2 — and won. She is excited to serve. As she campaigned door to door — her district stretches from Old Hill to Saugatuck — Schatz realized that was the only good way to meet constituents, and get a sense of the issues. RTM veterans warned her that most Westporters don’t pay attention to local government. Schatz is not sure. She thinks people want to be involved. They just don’t know how. But everyone is online. So Schatz decided to create a totally unofficial — but quite comprehensive — blog. Her plan was to compile biographical information on every member. She’d post agendas, reports about meetings and FAQs, plus short video clips. It would all link back to the town’s quite factual — and visually snore-inducing — RTM page. 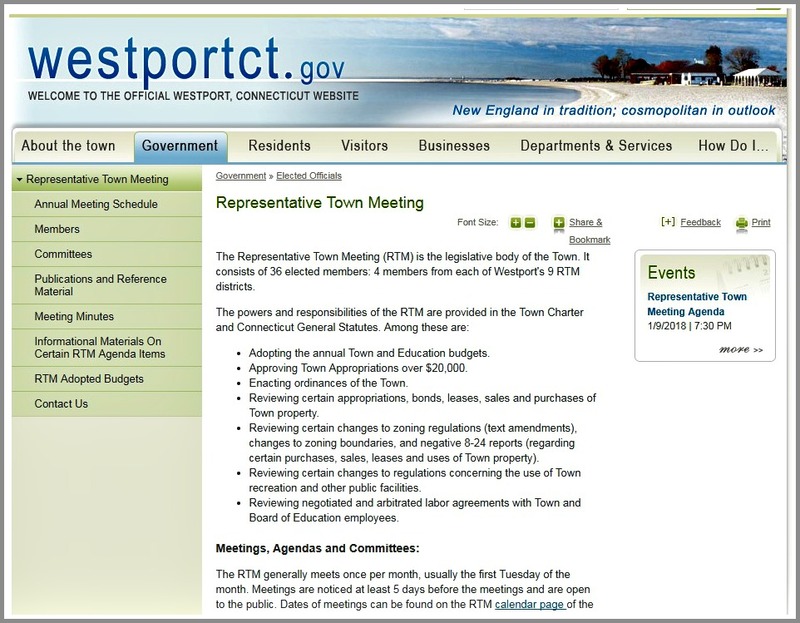 The official RTM web page, at WestportCT.gov. She called it “The Unofficial RTM Report by Christine Meiers Schatz.” She registered the domain RTMReport.com. Schatz researched all 35 RTM colleagues. Using publicly available information, she created profiles for each: education, profession, volunteer work, RTM committees. She offered links to each member’s personal website. She began building the rest of the site too. Suddenly — and to her surprise — a few members objected. Some wanted to provide guest posts. She created that opportunity — and was criticized for opening it up that way. Others did not want so much info about themselves provided online. Much of the information came from sources like the League of Women Voters’ Guide. One member protested that it was incorrect — even though it’s provided by RTM members themselves. 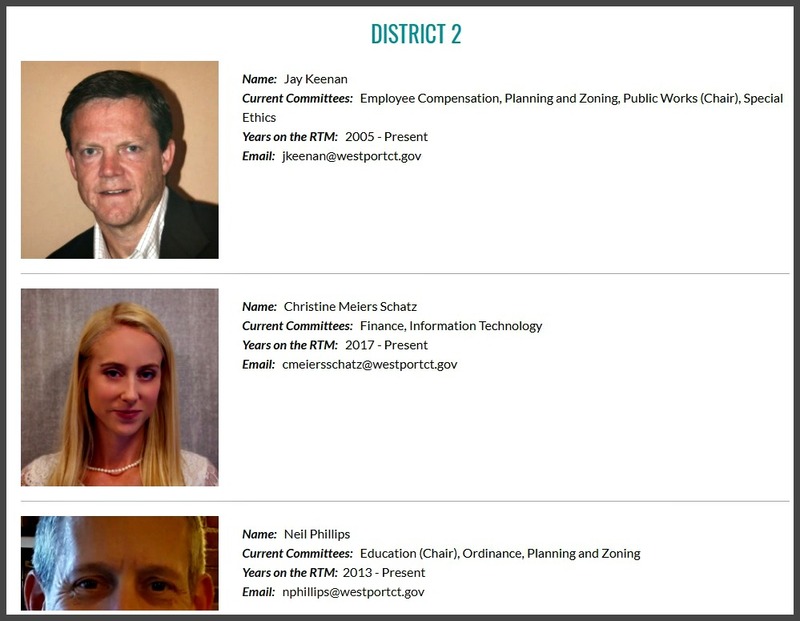 But — in deference to those objections — Schatz stripped most of those details from each member’s profile. A screenshot of the stripped-down member page from Christine Meiers Schatz’s website. This is for her own District 2. The blowback continued. Some members wanted the ability to provide their own, free-form paragraph about themselves. Others thought there should be a standard template. Right now, Schatz is seeking input and consensus from members on exactly what information and format is best. Of course, not all members objected. Nicole Klein praised Schatz’s “initiative and creativity.” Others applaud her efforts too. 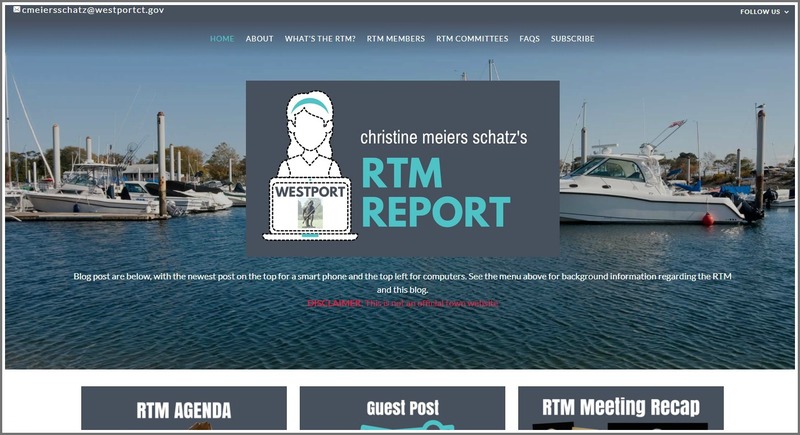 In a nod toward critics, Schatz changed the name of her blog to “Christine Meiers Schatz’s RTM Report.” And she switched the domain to SchatzRTM.com. The home page of Christine Meiers Schatz’s blog. And she emphasizes that she intends her website to be one way — among others — to get information to residents. For now though, Schatz’s site is the most robust RTM page in town. To check it out, click here. This entry was posted in Local politics, Media, Organizations, People and tagged Christine Meiers Schatz, Westport Representative Town Meeting, Westport RTM, Westportct.gov. Bookmark the permalink. I think this is an excellent effort on behalf of residents. The town could use such an infusion of “sunshine” on it’s rather dreary website. Thank you Christine Meiers Shatz! Good for Christine. There is nothing wrong with doing this and I appreciate how she spoke with fellow RTMs about the page and took in their suggestions. I think the big issue for some was ensuring that people didn’t think this was official. It is not it is opinion, offered for informational purposes only. If that is clear, then cool. She had put party affiliation next to names of a non partisan body, she removed them. There was also an issue with her video taping people at the podium which some felt was problematic. She agreed to use the town feed and edit it for her use. I set up my own website when I got on the RTM 12 years ago, http://www.westportd1.com which I have been lax with recently, but at times it was the hub of information for appeals to the RTM concerning Barons South, and Kemper Gunn etc….. There was great push back from some that it too was not official and how could I do what I was doing. I said I was supplying information. Now the Town will post much of what I was to ensure transparency in such cases. Good, they had not prior. Christine has already taken one of my eblast emails to my constituency and posted it. A public piece of info from an RTM member grabbed and put on the site. Clarification. I am fine with Christine republishing my eblast. I was saying she grabbed, (screen grab, term of art) and posted it. I put it out there and it is public. And having it reach more people is good. I respect her bold move to do this and even more so that she modified it after discussion with a number of other RTMs. Kudos to you Christine! I have a fear of town politics because of exactly what Dan described, there’s no low bar for silliness. You take a positive initiative and everyone wants to change it. Bios of public people is far from controversial. But you had pushback. To me, that’s beyond silly. But the positive message is your willingness to make this effort to keep people informed. I think that’s just great! I’ll try and keep up by reading the information you provide. Good stuff! Many thanks! Great idea. Town website is not easily maneuvered, often not robust in areas where timely information is important. (P&Z for example). Love Christine’s enthusiasm and efforts at increasing transparency. I agree that people want to be informed but often can’t easily find information they need. I just went to the website and thought it looked very professional. Some RTMers objected to the videotaping, but Christine has agreed not to do that, which I think shows cooperation. I thought the page explaining agenda items was very well written, concise and helpful. Her constituents are fortunate that Christine is willing to do all that extra work for free for her constituents and for the larger community. Christine initiative should be met with nothing but praise. She is taking the first of the many steps needed to add transparency to our local government and a modern way for constituents and their representatives to communicate. I am in Christine’s demographic – a mother with three young children and my husband and I both work full time and commute to NYC. We love Westport, and we want to be involved in key issues affecting our town, but we can’t do so unless our government uses modern technology (meaning the so-called so up or shut up mentality has to stop). Way to go Christine! I applaud Christine for her efforts to make the RTM more transparent and user-friendly. I understand some of the concerns of other RTM members, but they should all be addressable. Welcome to Westport Christine. Great work. Keep it up. It seems silly that some individuals who operate in the public domain don’t want their information/positions/words on record published. Is it because it’s much more easily accessible at her site than the official record? We operate in the online world these days, and it’s disingenuous for members to object to information they’ve provided in other contexts to be combined and published here. I think it’s valuable for us to know the official positions of our local representatives and since all politics are local, it’s the best way for us to stay informed and active. Keep it up, Christine! Really really well said Elizabeth! Totally agree! Christine is doing a great service here – making our local town government and officials’ actions accessible to all and responsive to their constituents. Christine was the first RTMer in my district to come to my door, meet with us and hear our concerns. I’ve been to RTM and P&Z meetings and not all of us can go to these late night meetings to access information or have the time to listen to the live feed. We want to know what is going on in local politics and Christine’s website is a great way to do that. Even freshman RTMers should be encouraged to fully participate and Christine has the energy and ideas to make some great changes here. I love how Christine is shaking things up with great intentions, transparency, her “unofficial website” and trying to get more parents with school-age kids involved in local government. Complacency is never a good thing and evaluating the status quo helps determine if there are better ways and approaches to interact and communicate between local officials and residents. This should be a wake up call to any RTM member who is uncomfortable to change and embrace technology, and be more accessible to your district. After all, you are “representatives” and your opinion should be based on the opinion of others and not just your own. In addition, our town website needs some major upgrades. Hopefully, Christine and other RTM members can lead the charge in these upgrades to a 2018 version of the site! Great job Christine! Nice job with this so far Christine. We discussed this idea and the need for it when you knocked on my door before the elections. Thought it was a great idea back then and now seeing the direction you have taken with the SchatzRTM.com site I like it even more! The town website is so hard to navigate and find info. Having it all here in one place about the RTM is clutch. I am much more willing to consume this info now on my phone and keep up to date on what is impacting me in my district! Thanks for all your hard work and for being open and responsive to all this feedback. Good luck! More participation in local government is a worthy objective and being informed about our elected officials is an obvious first step. Well done, Mrs. Schatz. I support Christine’s initiative to create more transparency in town government. Thank you for your sensible solution! 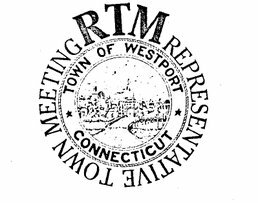 Given that the RTM is the legislative body of the town and RTM members are elected by town residents, it is surprising that the members’ basic info is not on the town’s web site. It is also befuddling that some RTM members objected to this. What Christine put up is vary basic information that should be non-controversial — RTM member name, current RTM committee, number of years on RTM and email. Not sure it is her place as a RTM member (and a lawyer) to be publishing anything without permission. I think it is the place of every Westport resident – and especially RTM members – to be proactive in trying to make our town a better place. At the end of the day, and even if these efforts are imperfect, they will be more beneficial than criticism alone. As a legal matter, one does not need to obtain permission to publish information that is already in the public sphere regarding elected officials. Elected officials have the same, constitutionally-protected right to publish this information without prior consent. But I did touch base with my colleagues and make significant changes to that page before making it visible to the public. It is certainly NOT my place to give you any suggestions, but Theodore Roosevelt’s “Daring Greatly” speech might be worth a read if you’re not familiar with it already. It is one of my favorites. Maybe not unethical, but inappropriate. Your comments are inappropriate Nancy. What if I’m from a “s-hole country”? or, to be fair, a product of “the basket of deplorables”. The LWV has been trying for years to get the public involved with the RTM. Thank you Christine for this initiative. As long as it is kept non-partisan and just factual this is a valuable tool for the citizens of Westport to become involved in THEIR TOWN!! As another Westporter in Christine’s demographic, I absolutely echo her contradiction to the RTM veterans: the newer-to-Westport residents and those of us with young children/families are not reluctant/resistant to be involved and informed, but many find it difficult to figure out how to do so effectively. Most Westporters I know echo what Christine is pointing out; transparency and communication from our town officials of all levels is lacking and outdated, but very much desired. I respect and very much admire Christine’s innovation in tackling this issue head-on. I am also in awe that she has received push back and echo the comments pointing out that it’s confusing any elected official would not want their public info easily accessible to those who elected them. The desire and necessity for transparency and communication in all levels of government should never be underestimated. To Christine: you rock. Your district’s constituents are so lucky to have you! I am excited for Christine and the other 11 new elected RTM Representatives. Fresh ideas and voices are always good. Our town is one that is always “in motion”. There is always something going on! As a member of the RTM, I welcome Christine’s page as another way of keeping our constituents informed. We are not an “old guard” club. The RTM has always been and will always be a non partisan governing funding body that puts the interests of our town and citizens first. We do our best to work with the Board of Finance, Board of Education, Board of Selectman and our various town departments to see that funding is distributed fairly. Thank you Dan for this informative piece on Christine. To the public reading this, know your 36 RTM members are always available. We do represent all 26,750 of you. What Mrs. Christine Meier Schatz has done is just extend more of a limb to those who are of interest to what’s going on outside their doors, and the ground their house is on. The transparency within government is essential to today’s very active population of interested residents. She tirelessly learned to code and make a website which took quite sometime, added photos and texts to beautify it and make it eye catching. And at what, the cost of her important and delicate time to bring news to people in another way? Brilliant, outstanding and benevolent.